A civilisation destroyed. A species doomed to wander the cosmos. A lone survivor feared by all, her voice silenced and her face veiled behind a metal mask. The Atlantia is all that remains of humanity: a former fleet frigate turned prison-ship now hunted by a terrifying force and haunted by escaped convicts threatening the survival of her beleaguered crew and civilians. Trapped in orbit around a foreign world, damaged and low on supplies, the crew of the Atlantia are forced to make a deal with the devil to forge an alliance of murderous convicts, exhausted soldiers and terrified civilians in a last-ditch attempt to confront the technological horror that has consumed mankind. 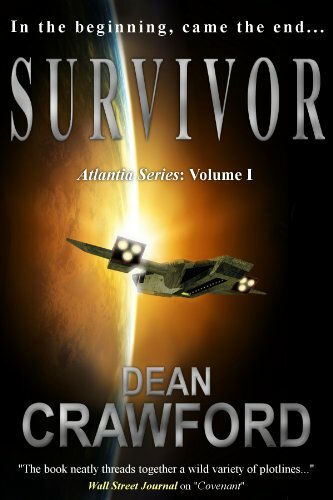 Survivor is the first volume of the Atlantia series from internationally best-selling author Dean Crawford, is DRM free and is 104,000 words in length. Dean Crawford is the author of the internationally published series of novels featuring Ethan Warner, a former United States Marine now employed by a government agency tasked with investigating unusual scientific phenomena. The novels have been Sunday Times paperback best-sellers and have gained the interest of major Hollywood production studios.